I will help you plan your special ceremony with care and consideration. 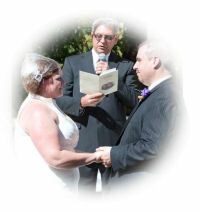 I have been assisting couples in Placer and Sacramento County in personalizing their wedding ceremony to make it special and unique for over 25 years. 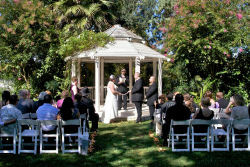 I accommodate both casual and formal ceremonies based on your ideas for your special day. I will work with you to make your wedding a very memorable occasion. This is your wedding and I will work with you to make sure it's all that you want it to be. Let me have the privilege of working with you to help you as you create the perfect wedding ceremony that will express your lives together. I look forward to meeting you. What can I say from the day we met I knew you were sent to bless us. 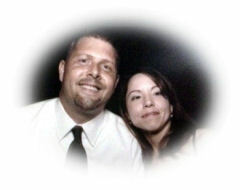 Your guidance through counseling and support helped us see love can over come anything. You were a calming presence reassuring us of what is really important. Seeing you waiting for us at the alter, and walking us through the vows patiently as we stumbled even cried and when we poured the sand in our ceremony we knew you'd keep it together. You helped facilitate our most special moment and make it one that we will remember forever. Without you I don't know if it would've been the same. I know we will all be internally grateful. My husband and I were looking for a non-denominational person to marry us. I searched for hours online and everyone was so unreasonable and expensive. Or they did their service a certain way and you either accepted it, or found someone else. Then I found Ken Birks. I researched his website and read what he wrote about marriage. He wanted us to have the ceremony that we wanted to have no matter what that was. And the price was right in our budget. Then we met him. He is a great person. He was so happy and excited for us and so laid back. His attitude eased my anxiousness and tension. He wanted to make us happy. We were the only ones that mattered. It really was a breath of fresh air. He gave us examples of vows because we didn't want to write our own. He allowed us to tweak them to exactly how we wanted. Then he made us a beautiful pamphlet with our picture, names, and date on the front. And inside was our vows so that we could always have them. This meant so much to us. And when he married us, as he said every word you can just tell how much he believed every word. I really felt he wished us every happiness. Ken was great. I couldn't have asked for a better officiant. I will recommend him to everyone I know. Thank you Ken! Thank you so much for officiating our wedding. On the most important day of our lives it was so comforting knowing we had you to guide us through the process. From our first meeting, dress rehearsal and the wedding you were a constant source of peace. Your future clients will be blessed to have you officiate their weddings, I know I was. Kim and I would like to thank you again for officianting our wedding. We had the greatest time and we would like to extend our thanks to you for your help on our ceremony. Ken was great! He was well prepared, experienced, and made our wedding day very memorable. We couldn't have asked for more on our special day. I am Becki's mom and I just wanted to tell you how beautiful the wedding ceremony was that you performed for Becki and Chad. I especially liked the Building Blocks to a Healthy Marriage. A person should read those at least weekly to remind us of our commitment to each other and the love we shared on that special day. I hope Becki and Chad refresh themselves by reading them often. I also loved the blending of the sands. I was so hoping that Abel and Daxon were going to be a part of the ceremony and I was thrilled when they were. I had never seen this done before and it was a very loving and symbolic experience. Thank you. You are a very patient man!! The two days were very hectic, but you remained calm and collected. Thank you again for a beautiful ceremony. 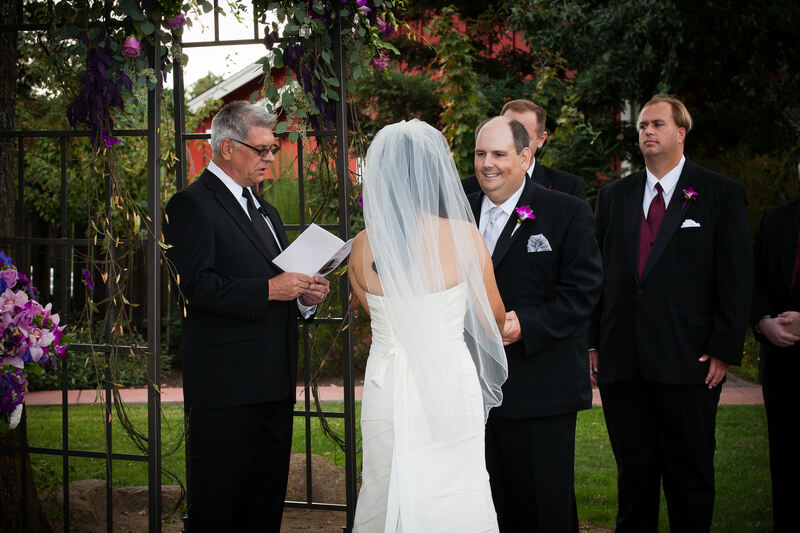 We knew from the beginning that we wanted Pastor Ken Birks to be our officiant. 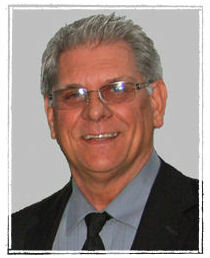 His professional and calming demanor along with his vast experience made him an easy choice. Ken walked us through every step of the process including developing our declaration and easing us both through our vows on our special day. Ken also took care of filing our signed marriage certificate with the County Recorder which we received back shortly after our Wedding. I'm glad we entrusted Pastor Birks to be our officiant and would highly recommend him to any couples looking to ease their concerns of having the right person officiating their wedding. Ken did our wedding (80 people) and was great. He's a well spoken, very experienced, well dressed, very nice person. He gave us lots of guidance, support, and 3+ hours of premarital couseling (for a small fee) but worth every penny, even if you have a great relationship (you will learn a lot and trust us, you WILL not regret the counseling). Note, we interviewed 2 other officiants, and they were nice, but expensive and not nearly as good as Ken.